We’re only three days away from the start of the USA next generation space program that could one day take humans to Mars. The space agency has replaced the old countdown clock, a NASA icon, by a brand new one just in time for the Orion launch, December 4. The new modern multimedia display is similar in design to the screens that we can see at sporting venues. The clock has a24-panel screen, 26 feet wide by 7 feet high, built by Mega LED Technology, a Los Angeles-based company. The $280,000 clock timepiece is able to do much more than just countdown to launch. It will provide accurate times for pre-launch procedures, as well as it will record the amount of time of the crewed missions that have been underway. A number of other clocks with similar functions will be mounted at Kennedy Space Center. According to some NASA’s records, the clock may date back to 1967. The clock was in use for several Apollo missions and all 135 space shuttle missions through 2011; and, in more recent years, for uncrewed NASA launches and numerous planetary probes. On January 21, 2000, the iconic clock was added to the U.S. National Register of Historic Places as part of a Multiple Property Submission. 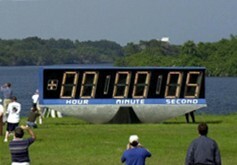 After being removed in three sections, the historic launch countdown clock was transferred to the Kennedy Space Center Visitor Complex, where, after some restoration, it will eventually be placed on public display, near the entrance and used to display the time on future NASA launches.